“To examine the spatial variation of stroke mortality risk during heat wave, we collected 418 stroke mortality cases with permanent addresses for a severe heat wave (July 28–August 15, 2010) and 624 cases for the reference period (July 29–August 16, 2009 and July 27–August 14, 2011) in Nanjing, China. Generalized additive models were used to explore the association between location and stroke mortality risk during the heat wave while controlling individual-level risk factors. 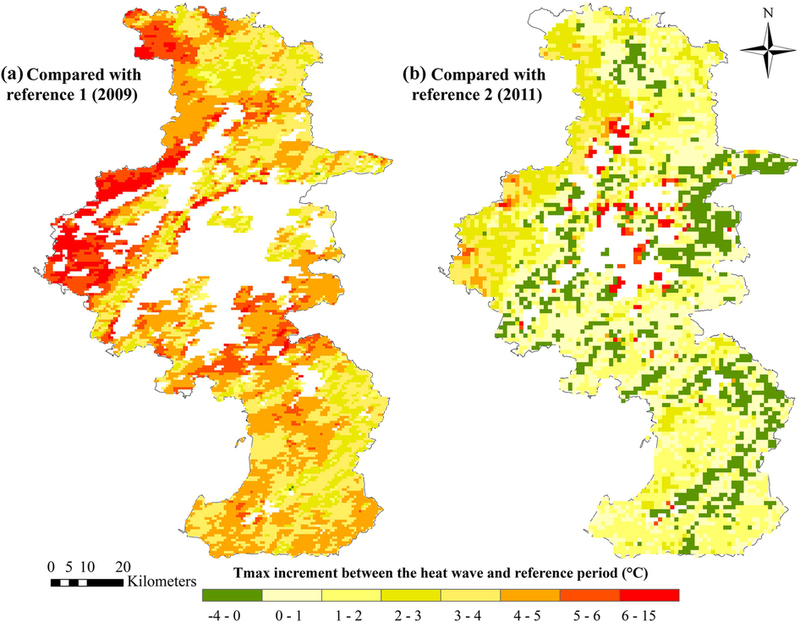 Heat wave vulnerability was then applied to explain the possible spatial variations of heat-wave-related mortality risk. (1) Using reference period 1 (A2); (2) Using reference period 2 (A3). Maximum of daytime land surface temperatures (Terra/MODIS, 1 km resolution) in each period (19 days) was used as the temperature exposure indicator. White areas indicate that land surface temperatures were not available due to cloud cover. Maps were generated using ArcGIS (version 10.0; ESRI, Redlands, CA).